Borsod-Abaúj-Zemplén (B.-A.-Z.) 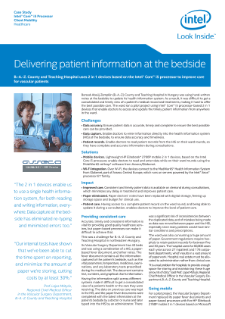 County and Teaching Hospital in Hungary was using hand-written notes at the bedside to update its health information system. As a result, it was difficult to get a consolidated and timely view of a patient’s medical record and treatments, making it hard to offer the best possible care. The ward ran a pilot project using Intel® Core™ i5 processor-based 2 in 1 devices... that enable doctors to access and update the timely patient information from anywhere in the ward. • Data accuracy. Ensure patient data is accurate, timely, and complete to ensure the best possible care can be provided. • Data capture. Enable doctors to enter information directly into the health information system (HIS) at the bedside, to ensure data accuracy and timeliness. • Patient records. Enable doctors to read patient records from the HIS on their ward rounds, so they have complete and accurate information during consultations.